Reprise of: New bike a Republican? (aka my bike doesn't lean LEFT). HondaCB1.org Message Forums > General Category > Tech Corner > Reprise of: New bike a Republican? (aka my bike doesn't lean LEFT). And it ended (for a while) like this…. After a minute or so on choke I saw the temp gauge bump so I started to ease off the choke to 50%. Idled fine. More rocking, etc. 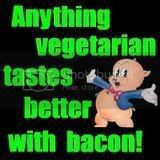 and no strange symptoms. Last week the bad mojo returned I have been riding my bike more given the spring weather and for the past 250 miles no real issues. Then last week I was running in hot weather and the engine died while at a stop light. I could restart the engine and rev it but it seemed the engine was reluctant to idle and would drop and die. Rolling on the throttle would keep it going and even leaving the choke ½ way at stoplights to reduce my stall-out anxiety (so stressful!). I suspect it may have had to do with the high engine temp and possibly the fan kicking on (electrical?). I continued on with my ride for another 30 miles and the 45 return trip without issue though it was cooler and late at night and all highway riding. Then earlier this week leaving from work, bike on side stand, choke on, turn key, engine revs up to 3k. Put on gloves and helmet so after maybe 1-2 minutes lowered choke 1/2 way and straddled bike. Thought to lean the bike to the left for "fun" and the engine died!!! I tried again and could repeat the effects of leaning the bike. Lean left the idle drops and the engine struggles, move back upright and the engine recovers. By this time the bike was significantly warmer but still not quite in the normal running range on the gauge. I turn off the choke and lean to the left, this time no effect. For now it seems that the leaning left issue occurs only when the choke is ON. Anyone have ideas on what could cause this strange behavior? Re: Reprise of: New bike a Republican? (aka my bike doesn't lean LEFT). I'd really like to know, as my bike does it too. Guessing it's one of the small channels in the carbs relating to the choke circuit which is blocked so that one or more carbs get no extra fuel at certain lean angles. Solution in that case would be a long soak in an ultrasonic cleaner. I can tell you that replacing the seals doesn't fix it. That said, I'd still recommend getting a set of viton rubber seals at litetek.co if you're planning on splitting the carbs, they are cheap to buy and you'll definitely find at least one split and perished seal while you're in there. Is there a connection or red herring regarding the other symptom of the engine slowly fading to 0 RPM when I'm stuck at a stoplight: choke off, fully warmed up, upright, throttle closed? The fan did come one during one of these bouts but doesn't seem to by directly responding to the fan being on (which could suggest an electrical issue). Further, the RPMs can be kept alive (increased to say 2k RPM) by application of choke. If a choke enrichens the mixture (right?) does that mean my bike might be improperly adjusted lean? I'll take a stab at this. The only effect I can see that leaning the bike could have on the richener system (bystarter valves as Honda calls them) is one of changing the fuel level in the float bowls. Or more precisely, making the fuel level shallower on the right side of each float bowl. When I had my carbs apart for seal replacement I took photos and traced all the circuits, but unfortunately I deleted the photos by mistake! But what I found is that the bystarter valves have their own fuel and air supply, separate from the main and slow jets. The bystarter jets are pressed into the carb body and not removable with a screwdriver. They are offset slightly to the right side of the float bowl and have an extremely small opening - I had to use a single strand of very fine copper wire to probe them, as well as spraying cleaner and compressed air through to confirm they fed the bystarter valves. But here is the odd thing: in the carb body just above each jet there is a rather crude hole communicating with the passageway the jet goes into. Damn I wish I had the photos. I have no idea why there would be a precise tiny brass jet metering fuel into the bystarter circuit but also a rough drilled hole just above the jet adding fuel to the same passageway. Those rough holes would normally be submerged in fuel when the bike is upright, but when leaned left they might be above the fuel level. And if one or more of the tiny bystarter jets were clogged, possibly the system would still work when upright but not when leaned left. So I would want to check those pressed in jets as well as carefully checking float levels. Without the photos I am just going by memory here and might have some details wrong. Maybe if someone has a carb apart and can post up some photos of the inside of the float bowl I can point out the details above. Anyway, my money is on some effect of the sloping fuel level on fuel supply to the bystarter system. I'd go with the red herring since when the bystarter valves are closed they are not supplying any mixture, assuming their rubber seats are not damaged or one or more is mis-adjusted to stay open slightly. That is always possible. The brackets that actuate the valves are individually adjustable on the rod, and adjustment can be made just by pulling the air box. On the dying at idle, I would first go through the carb synch/mixture screw adjustments assuming the screw limiters are already removed from the float bowls. I’ve got some photos from a couple of years back when I cleaned my carbs. Thanks James. 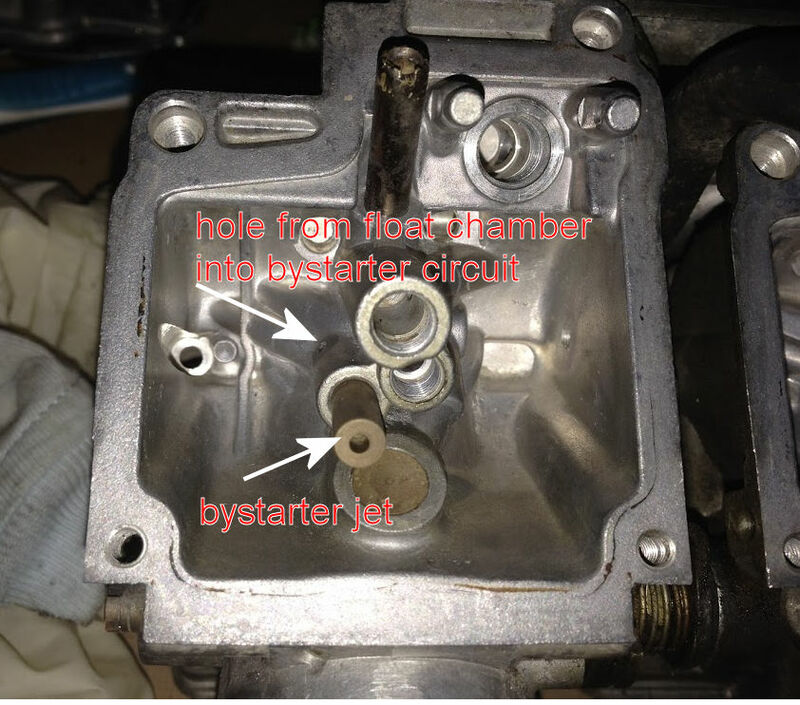 OK I was wrong about the bystarter jet, it is actually on the left side of the carb meaning they are submerged deeper in fuel when the bike is leaned left. So I'm not sure what is going on, but would still want to check float levels and all passageways in the bystarter circuit, especially the very tiny hole in the jet. Possibly the mystery hole is above the fuel level and therefore takes in air to help atomize the bystarter mixture, but when leaned too far left and with float level too high the hole takes in fuel making the mixture too rich? By the way I just tested my bike and found that with the choke ON it runs the same whether vertical or leaned over, Since I only have a side stand it's always leaned left when warming up. I have to lean it over to at least 45 degrees to make it die - that is the same with choke on or off - and that happens because gas is pouring out of the carb vent hose because of the extreme angle. So no help here except to say that the stalling while choked and leaned left is not normal, or at least not universal. Hi Bill, what is the hole on the left chamber wall at the same level as the "crude hole"? From a manufacturing perspective how the heck did they drill the "crude hole" if it's orthogonal to the jet tube. There is very little working space. I'm not sure if this helps but just to add to what everyone else has said, on choke if I start the bike on the center stand and then lean it over to the side stand the revs drop slightly. It's always done it and doesn't really cause a problem for me. I cleaned my carbs last year and it made no difference. The crude hole is drilled at a downward angle intersecting the passageway holding the pressed-in jet, so no problem with manufacturing access. The hole to the left is the float bowl vent which connects to the vent hoses marked "6" in the manual and with a label on the hoses themselves. When I lean my bike way over to the left the idle stays the same until finally at a very extreme angle gas runs out of those vent hoses and the engine dies! Lean left as far as I can and see if fuel drips out vent.